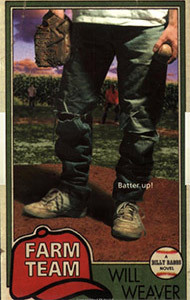 The second “Billy Baggs” novel, Farm Team, showcases Billy’s heavy burdens. His father is in jail, and Billy must run the farm plus deal with a prying social worker. The barriers seem impassable, but Billy’s growing love of baseball–a passport out of isolation and guilt–carries the day. Billy and his rural friends put together a team of their own–girls, boys, a couple of city kids, two brothers who are migrant workers in the area–it doesn’t matter. They just want to play baseball, and Billy’s team turns out to be surprisingly competitive. Farm Team climaxes when Billy’s team of misfits takes on the town team–but, as always in Weaver’s novels, the final score is less important than the human drama. “[I]nfused with joyous optimism.” (Starred review)—Publishers Weekly. Striking Out was a bit dark in spots, and Farm Team lifts the series upward into sunnier territory. It has some good humor in spots, and I love the natural diversity of the “farm team.” Ending a novel is always tricky, but Farm Team has one of my best.